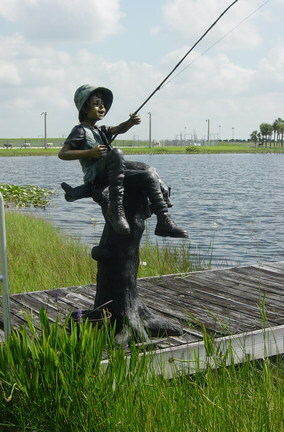 You are now located in Fishing category which contains other subcategories listed bellow. So if you wanted to buy Fishing than select from other subcategories bellow. Note: Item is typically in stock. If it is not in stock, please allow up to 2-3 months for manufacturing. Our customer service department will be glad to help you with any inquiries regarding manufacturing times. Call 800-856-2638.With this exceptional piece you will find the ultimate path to creating surroundings of beauty and distinction for years to come.The Randolph Rose Collection is the premier source for the finest Bronze Sculptures, Fountains and Statues for the home, garden and public spaces.Since 1972, Randolph Rose Collection has placed their Bronze Statues throughout the world at the finest homes, gardens and public spaces. 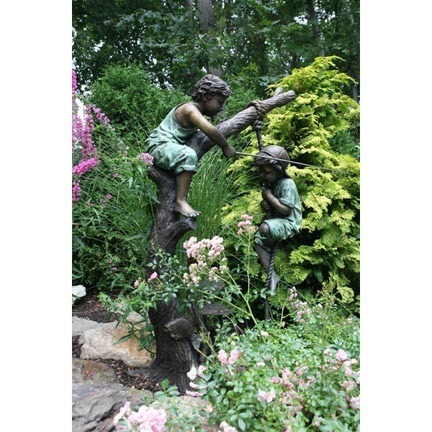 Whether it's a spectacular Timeless Children Statue, Life-Size Bronze Animal or a Classic Bronze Fountain and Urn, be assured that you have come to the leader in bronze art for residential and commercial applications.About The Randolph Rose Collection:The Randolph Rose Collection is a family owned and operated company that specializes in handmade bronze garden sculpture, statues, fountains and accessories for home, garden and public spaces. 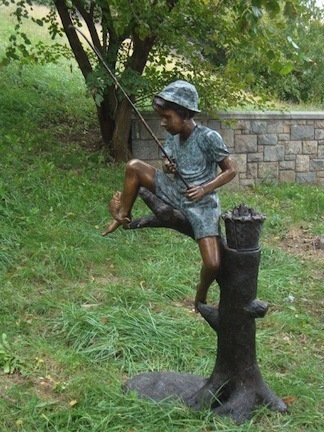 Randolph Rose Collection has placed their works of art at libraries, municipalities, schools, parks, recreation facilities, art galleries, retailers, builders, designers, landscape architects, golf facilities, charitable organizations and private home owners.Their collection of Lost-Wax Cast Bronze Sculptures include Life-Size:Children Reading, Relaxing and Playing SportsChildren with Special NeedsSports FiguresAnimals – including horses and wildlife Classic Roman and Greek SculptureTraditional FountainsUrns and Planters Custom and Limited Edition Sculpture DesignsPatina & Finish: Each Randolph Rose sculpture will have some variation in color. The patinas are hand applied which not only enhances the beauty, but also makes each sculpture unique in appearance.Care & MaintenanceTo Clean:Remove dust with a damp cloth.Do not use metal objects or wire brushes to clean the sculpture.Do not apply abrasives or cleansers that will possibly scratch the finish.ZUD – Non-Abrasive Cleaner. Use to remove stubborn stains. Zud cleans all metal surfaces including bronze. Zud can be used in powder or liquid form.To Maintain:Lemon Oil or Paste Wax (NOT BOTH TOGETHER))Lemon Oil: This will give the sculpture a shiny appearance and repel dirt. Apply a small amount of oil with a paintbrush or soft cloth. Cover the entire figure with oil. Wipe the surface gently with a soft cloth to take off the excess oil.Clear Paste Wax (like Johnsons Paste Wax): This will protect the sculpture. Do Not use automotive waxes. Use a very thin, even coat of wax should be applied with a soft cloth. Allow the wax to sit and dry before polishing. Wax should be applied after bronze has been cleaned and dried. Do not apply if using lemon oil.Do Nothing: Many bronze owners prefer to sit back and enjoy the natural reaction and aging process of their sculpture.Lost Wax CastingAll Randolph Rose Collection Bronze Sculptures are designed and made by the “Lost Wax” Casting Method. 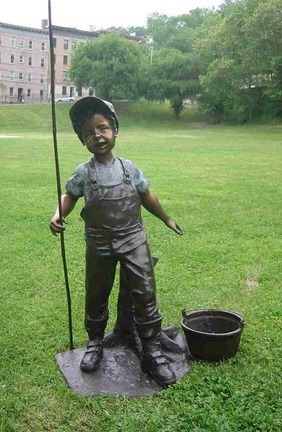 Bronze art casting using the ancient “lost wax process” has been around for thousands of years. This labor intensive process takes several weeks from start to finish. Bronze is an alloy. It is a mixture of 95% copper, plus small amounts of tin, zinc, and silicon. The following includes a description of the procedure:The artist creates an original sculpture from either clay or wax.A rubber mold is made of the original sculpture by applying numerous coats of rubber over the original. After this is cured, it is removed. This new rubber mold will show every exact detail from the original. This mold is used to create duplicates of the original design.The rubber mold is filled with molten wax. After the wax cools, the rubber mold is removed from the wax. We now have a wax duplicate of the sculpture.The artists will hand-finish the wax to match the original.Wax rods and wax funnel are attached to the wax duplicate. This will alleviate the trapping of air and gas.The wax duplicate is coated with a liquid ceramic. This is done several times to create a stable mold. This is cured for a few days.The wax mold covered in ceramic is fired up in a kiln. The “burn-out” process bakes the shell and the wax melts out of the shell. This is where the “lost wax” name comes from.The ceramic shell is taken from the kiln and molten bronze is poured into the mold.After the bronze cools, the ceramic mold is carefully removed. 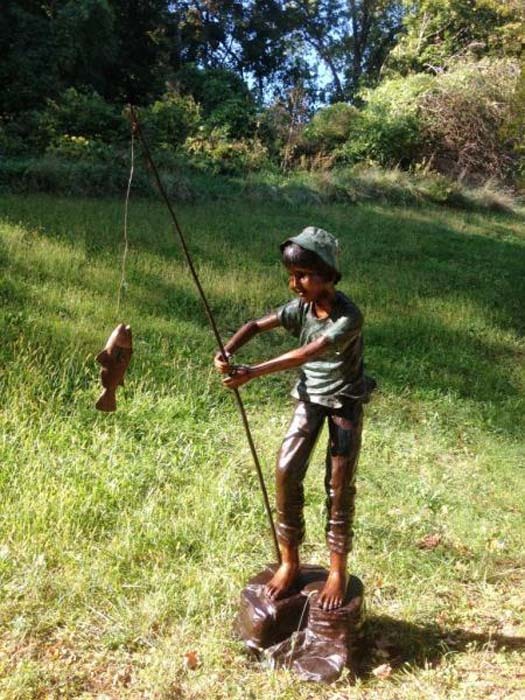 We now have a bronze sculpture.The piece is now sandblasted and cleaned to remove any fragments.Artists will hand finish the bronze to look exactly like the original.Finally, chemicals, acids and heat are applied to get the desired patina. Wax is applied to the bronze for a protective finish. 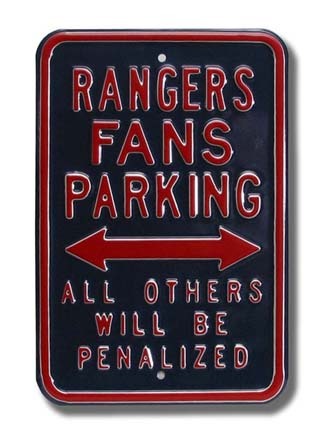 18 gauge steel sign. Hang this sign next to your biggest catch! "Women Want Me, Fish Fear Me" is the perfect addition to any fisherman's collection.There is no actual image of this item. The image shown is representative only. The actual item will have the wording as described above.